When people compare the Palm-compatibles to Pocket PCs, the most glaring difference is the use of color. Palm tried to answer with the Palm IIIc; Handspring, however, does color right with the 16-bit Visor Prism. 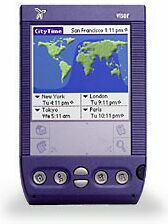 The Prism is the most advanced Palm-compatible to date, featuring a 33 MHz Dragonball V2 processor, a beautiful 16-bit Epson LCD screen, and Palm OS 3.5.2H. It has a cobalt blue casing that is slightly thicker than the Visor, however, this is only at the top of the back of the Prism. The back of the Prism is curved so that you can grip the Prism without it feeling thick. The power button has been moved to the right side of the Prism because the light tube is on the left side -- keeping the power button on the left would have increased the Prism's size. There is an LED under the power button that blinks when you're charging the Prism. The other major addition is the rechargeable Lithium Ion Battery that is encased inside the Prism. No hard cover, but a deluxe graphite stylus is included. Before you turn on the Prism, look at the screen. You will notice that the screen, when off, is completely black. It is also highly reflective. When I first turned on the Prism I was surprised at how bright the screen can be, especially in lower lighting. To adjust the brightness, hold down the power button to bring up a screen (similar to the contrast slider) and adjust to your liking. The higher the brightness, the more battery power is needed. I found a middle setting is effective in fluorescent lighting, and that you can turn the brightness down all the way and still use the Prism effectively. I can finally can use a Visor effectively in low lighting. I hated the backlight of the Visor Deluxe and am very happy with the brightness control on the Prism. The screen is not without its problems. It is so reflective that I can see myself even while using the Prism. This wasn't distracting to me, but some may want to invest in a screen protector to reduce glare. I also noticed that some of the lighter colors can shimmer when moving the Prism. This is not a problem with dark colors or with moving objects. Also, if I look very closely, I can see the individual pixels of the Prism. It is more difficult to see this pixelation when holding the Prism like normal (or when I take off my glasses ) . I also had problems using the Prism in daylight. You will also find yourself adjusting the brightness much more than you adjusted the Visor Deluxe's contrast. » Dimensions 4.8" x 3.0" x 0.8"